Don’t you just love this new stamp set (Friends Never Fade)? I think that’s why I cased all these cards….This is one of the sets that’s really hot right now, so everyone is using it…meaning if you purchase it (thru me or anyone else) you will have no problems finding more ideas and examples than you know what to do with. This next card is just a 3×3 little thank you note, or you could adjust it and make it into a gift tag by simply changing the greeting. 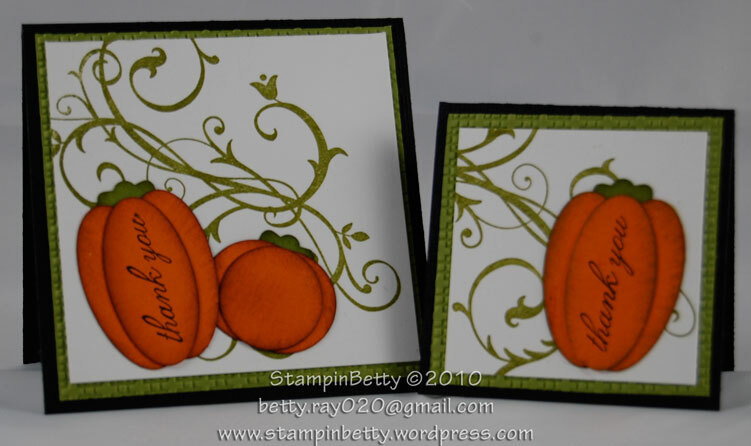 This card is cased from another card from the demonstrator-only website by Terri Walker. First of all….let me tell Ya’ll (getting back to my southern heritage…) I almost fell off my seat when I logged in today and looked at my hit counter!!! At first all I saw was that diagonal line just racing up with every hit coming in, then when I looked closer I realized I had OVER 200 hits TODAY alone, and the day is not even over. Can you imagine how big the smile on my face was. Let me tell you, I was smiling from ear to ear, and if my husband were home I would have ran right down to him jumping up and down like I had just won the lottery. So today’s project is a dedication to every single one of you who have stopped by to check out this newby blog. If you keep showing me this kind of love there is no way I could possibly fail at this challenge. I would feel way too guilty after all the great responses I have been getting from all of you. Just last week when I finally posted that first project I sat here thinking how silly this might be, and how in the world would people stumble across me, but some how, some way you have all stumbled to me. The huge bump in hits I got today is most certainly due to the gallery I posted over at Splitcoast Stampers just last night! 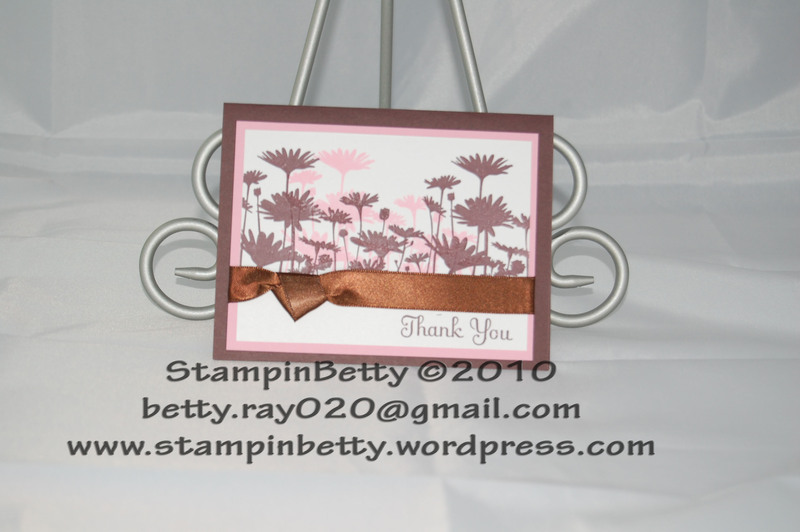 So I will do my best to keep Splitcoast Stampers Updated with the new projects as well. Originally I had popped over there to see what great challenges they had going on. Those challenges are a fantastic way to get the creativity pumping when you are experiencing a block…. So here is my great big thank you to YOU!! As you can see this is a very simple yet pretty card. It is probably one of my favorites…. Hmmm maybe I should use this on at my upcoming workshop this Thursday???? The chocolate chip ribbon does not look like it matches in the photo, but there must have been something going on with my camera flash, because in person it looks great. Please keep the positive feedback coming, and if there is a project you would like to see me tackle on this adventure let me know, and I will see what I can do!